BUSIA – Geoffrey Wandera, an independent candidate, was on Monday morning declared the new Busia LC5 chairman after two other candidates stepped down from the race, bringing to an end a dramatic race for the position that climaxed last Friday with the cancellation of two favourites from the race. Wandera and two independents Chrispus Bwire and Tony Ojambo had remained in a largely weakened race after DP and joint opposition candidate Deo Hasubi Njoki and the ruling National Resistance Movement (NRM) party candidate, Paul Boniface Oguttu, were on Friday kicked out of the race by the Electoral Commission (EC) on grounds of discrepancies in their academic papers. However, in dramatic fashion on Monday morning, Mr Umar Kiyimba, the Busia district returning officer declared Wandera, who is NRM leaning, unopposed. 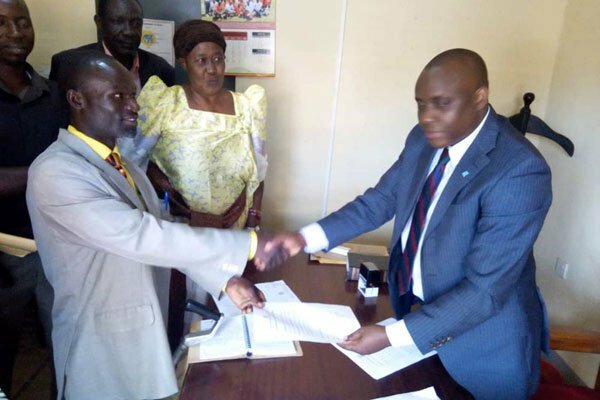 “I hereby declare Mr Geoffrey Wandera as the elected district chairperson of Busia District,” Mr Kiyimba said, adding that the parliamentary election act mandates the EC to declare a candidate winner in case his or her opponents withdraw from the race. In response, Wandera called for unity. “My leadership will be creating a district that works for everyone in all sectors with discrimination most especially in health and education,” he said. The EC, in a letter dated November 23 addressed to NRM and DP, the EC chairman, Justice Simon Byabakama, disqualified the candidature of Njoki (DP) and Oguttu (NRM) from the race on grounds of discrepancies in the names they presented for the nomination. DP has announced that they will go to court, protesting the disqualification of the party candidate from the race. On Friday, Gerald Siranda, the DP Secretary General, lashed at the Electoral Commission for what he described as playing politics in the disqualification.